Few weeks back was Mahashivratri, a very important festival in India dedicated to Lord Shiva. 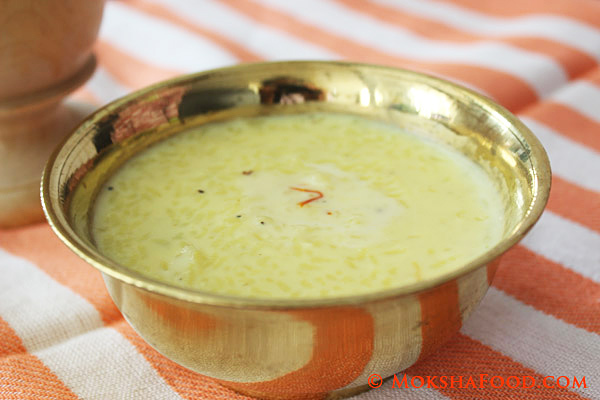 Since Rice Kheer is known to be his favorite dish, I decided to make that as bhog (offering). This recipe is a traditional Bengali dessert called Chaler Payesh or rice pudding. Rice puddings are made all over Indian in very similar ways yet this recipe is distinctly different. The main ingredient here is a specific variety of rice called GobindoBhog rice. This is a short grain fragrant rice used exclusively for payesh. Also the mixture is cooked till most of the milk is absorbed and it reaches a thick creamy consistency. 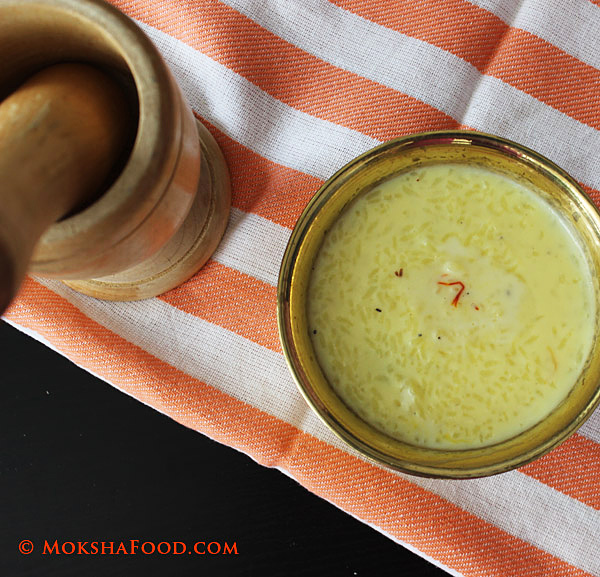 Payesh can also be made with the regular fragrant basmati rice. I love to add saffron to most Indian desserts as it gives a beautiful pale yellow hue and lends an exotic aroma and taste to milk based desserts. Bring the milk to boil in a heavy bottom pan. Keep stirring so it doesn't scald the bottom of the pan. Add bay leaves and cardamom. 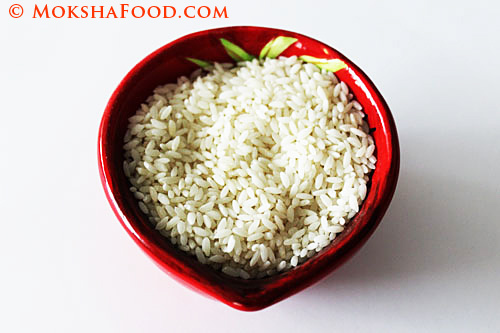 Wash the rice well and after draining the water, mix in a teaspoon of ghee. This is done to keep the grains separated. Once the milk starts boiling, add rice. Mix well and keep stirring intermittently. Once the rice cooks, add sugar and saffron. Stir the mixture till most of the milk is absorbed and it thickens. If you like it little runny then switch off the heat earlier. It thickens as it cools too. Lastly add the raisins. They will plump up gradually. Remove the bay leaves and cardamom pods before serving. This rice pudding/payesh is fragrant, pale yellow in color. Its rich, thick, creamy texture makes its a great comfort dessert. It can be served hot or cold. Taste great either ways. 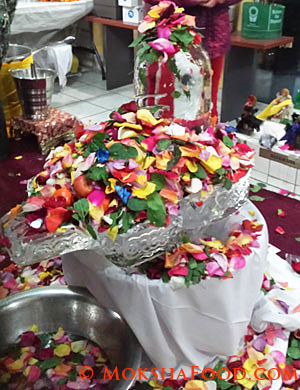 This is a beautiful ice lingam created at the Ram Mandir, Mississauga.